This spectacular reserve, tumbling from the heights of the Ngotshe Mountains a thousand meters down into a deep valley, carved over the eons by the Phongolo River revealing the world's oldest rock formations makes Ithala Game Reserve a game viewers paradise. Ithala Game Reserve is located within the rugged, mountainous thornveld of northern KwaZulu-Natal, the reserve's multitude of habitats host a spectacular array of wildlife species. Its panoramic beauty aside, Ithala Game Reserve's most characteristic attribute is perhaps its astonishing geological diversity. Some of the oldest rock formations in the entire world are found at Ithala Game Reserve, dating back 3 000 million years. With a topographic profile varying from 400m above sea level in the north to 1 450m near Louwsberg in the south, Ithala's terrain extends over lowveld and densely vegetated riverine valleys to high-lying grassland plateaus, ridges and cliff faces. The area now proclaimed as Ithala Game Reserve has been occupied by man for thousands of years and there are many sites littered with stone age spear and axe heads dating back some 20,000 years. There has even been a middle stone age tool found by archaeologists which pushes the date back to anything up to 200,000 years. Recently, in the last few hundred years, with the advent of the Nguni people, iron smelting took place in Ithala and there are a number of smelting sites adjacent to deposits of banded ironstone which was crushed to provide the iron ore.
Ithala Game Reserve has presented the setting for a number of ancient events, from Shaka's rule together with those of successive Zulu kings, to a variety of gold mining enterprises in the early years of the 20th Century. 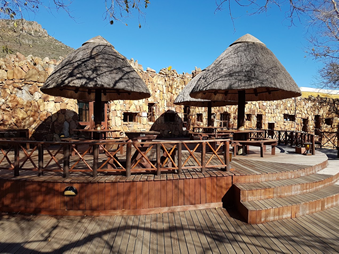 Ithala Game Reserve provides an outstanding vehicle trail to aid guest's game watching, and a notated guide booklet is available in the shop at Ntshondwe, Ithala's superbly designed, multi-award winning camp.